every single bolt and removed all the panels. (This took a few days. It wasn’t necessarily challenging work but holding a either a 30 pound grinder or a 15 pound power drill above your head for a few hours ends up being a bit of a work out.) I ended up taking out all the bus windows, drivers seat belt, the rear heater and the lines that supply the water/antifreeze from the front of the bus too. 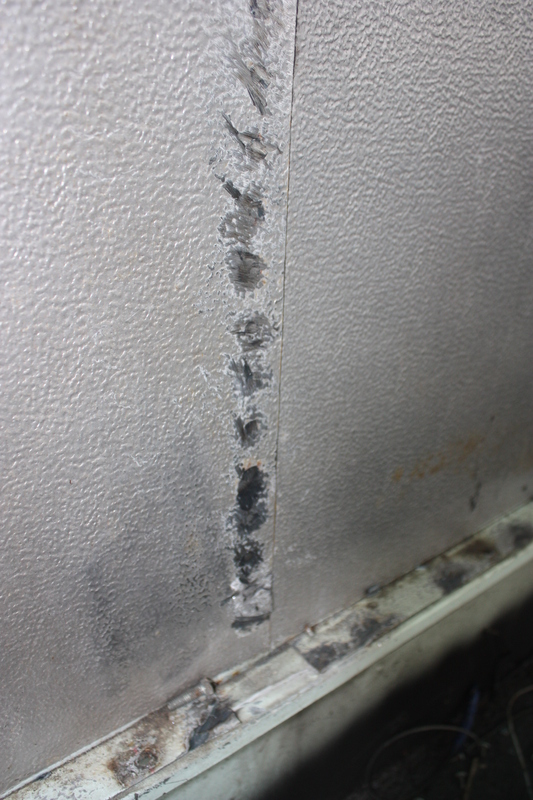 When it was all said and done, I’d found certain sections of the bus’s walls were no longer insulated and at one point there had been mice living between the panels. I left the insulation in for the time being (because, you know, its been freezing outside for a few months). 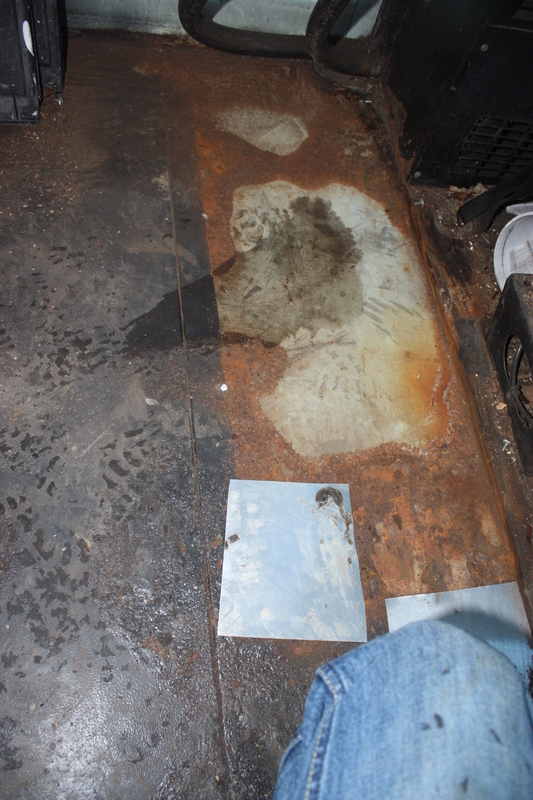 THANKFULLY all of the rust was contained to the floor. I was left with the empty shell of the bus. Lastly I bought a thing of plastic sheeting that was something like 20x100ft. I cut it in half (20x50ft) and draped the whole bus in plastic. This was mostly to block out the wind to get the biggest bang for my buck with my paint – its something like 80-90 bucks a can, but the pleasant surprise was that it insulated me from the cold pretty well. As for the rust itself? For the most part, it really wasn’t too bad. Perhaps a little scary at first sight but once I got to work, most rust was limited to the very surface of the metal. It was interesting to find that it was concentrated more closely to the very front of the bus where obviously there was more foot traffic. Something I didn’t expect but made sense. Secondly the back wall and floor nearest the emergency exit must have had some DIY work done in its past because it was pretty heavy there as well. Anyways to prep all the surfaces, inside and out, I took a grinder and bought a wire brush attachment and anywhere there was any sign of rust, I spent some time removing as much particulate as possible. Some of it came up immediately exposing the steel shine beneath and in other places, I was taking out pretty large chunks of the red stuff. I was using safety goggles and probably should have been wearing a mask for this portion (rust dust is pretty bad for you). After I’d finished up with the wire brush attachment I put the diamond tipped grinding disk back on the grinder and finished off removing the largest chunks and swept up a few times. Finally I was ready for paint. I was using a couple of cans of truck chassis saver (remember the black paint in the wheel wells of your school bus growing up?) The paint calls for basically a particle free surface so now that the floor and under-body were prepped, I broke out my dad’s air compressor and bought a cheapo paint sprayer. When we asked the guys at harbor freight tools which kind of paint spray can we should get they told us to go as cheap as possible because this paint will basically ruin the sprayer after you finish and it dries up. So I got a large gauge air-spray can and a paint respirator and some junky old clothes and got to work. *triple check to make sure you get a sprayer that can handle the viscosity of this paint. Home Depot’s sprayers are designed for latex and oil based paints where are much smaller gauges and just wont work with this stuff. Before and after rust-prevention paint. Saw that kind of rust all the way down the bus. 1. Buy. a. respirator. I’ve said it twice. This paint is really nasty stuff. I didn’t take off mine the entire 7 hours I’d spent finishing the paint job. When I finished my eyes were burning and the fumes nearly knocked me over standing outside the emergency exit door. 2. Your clothes will get ruined. Plain and simple. Nothing will take this paint out. I was wearing gloves and what did get on my skin didn’t wash off for a little over a week. Also ruined a few pairs of goggles. The painting itself is as straight forward as it sounds. Point and shoot. If an area is grey metal or red rust, turn it into black paint. The only tricky parts were underneath where the cross beams supporting the floor have a lip and I couldn’t angle the spray can very well. For that I just did the best I could. A helpful hint for spraying the under-body is saving one of your bus seats back cushion to sit on. They kept me off the ground so I was warm and it was better than crawling around on the cobble stone driveway. 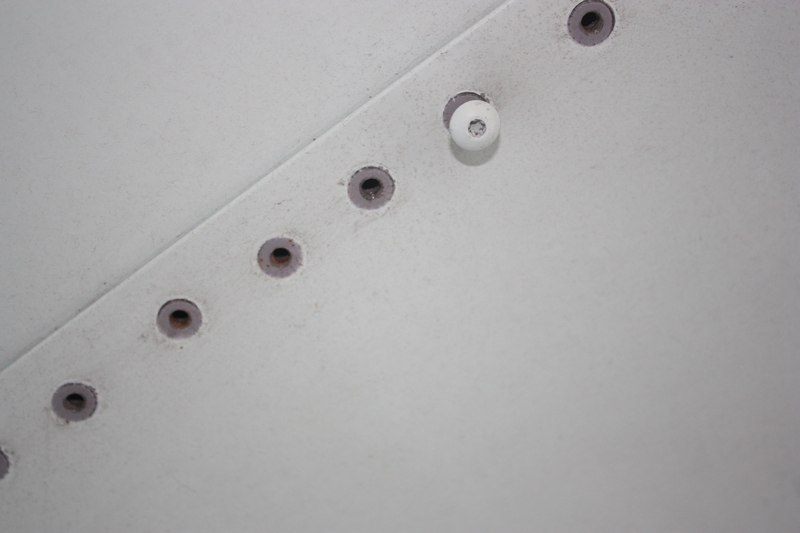 The last part of the whole process was to patch every hole where the seats had been bolted to the floors and any hole that had simply rusted through over time. At first I was a little perplexed on how to do this because I didn’t have scrap steel plating to weld with at this point. My solution was to buy some aluminum flashing and roofing caulk. I caulked a circle around each hole, cut the flashing to size, and made another line of caulking around the edge of the flashing. Then I pressed it down by standing on it. The idea was that should the inner circle of caulking fail or the hole become larger due to additional rust being formed somehow, I’d have a back up lining so water couldn’t spread around underneath the sub-flooring. The original ply was pretty rotted and I didn’t want to deal with that again. And that’s pretty much it. Painted and water proofed, I’m ready for construction. Before and after rust-prevention paint. Previous: Previous post: Bus Conversion Expenses: Breakin’ it down now.